I don’t know about you, but I have more than a few things to worry about. Some big, some small. Some short term, some long term. A few things I have some control over and others that I have no control over. On top of that, I receive emails filled with details about additional things to worry about as if I should join the sender in their concern. There are a lot of things to worry about. If I choose to, I could worry about my car falling apart, my yard that needs mowing, a project that is really late, bills that are behind, the lack of money that is coming in and the fact that I have no health care. Oh, but that’s not all. I could also worry about my office that is a mess, or that many people, friends of mine, who struggle with little income and worse circumstances than I. While I’m at it I could also worry about our state and federal governments and everything else that is madness in the world. My friends, all that I’ve listed here are genuinely a part of my reality. Now I know that many of you have even longer lists than I. Some of you might be tempted to say “big deal, you think you’ve got problems, take a look at my list!” What I find fascinating is that I know people with long lists with poor circumstances that worry less than people with shorter lists and seemingly smaller issues. 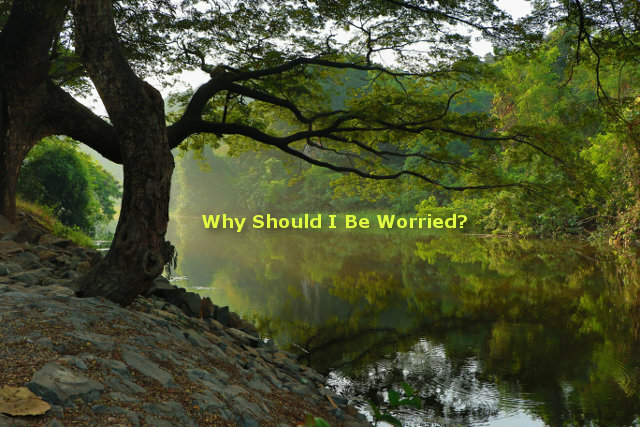 Our worries and concerns are relative and in no way can be compared with someone else’s. People that live an “easier life” should not be put down or their problems minimized because they don’t “compare” to mine. Who am I to judge? It really is a choice to worry, but harder for some to break. I’ve been told by people that their mother worried so it became a learned habit for them, or even maybe a genetic trait, I don’t know. Some people can hide it well and some people wear it on their sleeve. Appearances can be deceiving, people don’t always “have it altogether” as you may think. What amazes me is that I can be out doing anything and can be in a cheerful mood when I suddenly have a worrisome thought enter my mind. If I ruminate (Beth’s word, not mine) on these thoughts without considering the sovereignty of God and His plans and purposes for my life then I’m left hopeless. It is that simple. Without God, there is no hope. If I fail to acknowledge my Creator then my cheerful mood quickly turns to despair. This is just one reason why it is essential to spend time with God daily in prayer, His Word, and spiritually charged fellowship regularly if we want any hope of having a joyful life regardless of the circumstances. I think worry or fear is the absence of or lack of faith. Is God truly sovereign? Is He in control? Does He want what’s best for me? Based on this passage from Psalm 112 I think the measure that someone worries is an indicator of how well they know their God, personally and/or intellectually. 1 John 4:16 We know how much God loves us, and we have put our trust in his love. Romans 5: 3 We can rejoice, too, when we run into problems and trials, for we know that they help us develop endurance. 4 And endurance develops strength of character, and character strengthens our confident hope of salvation. 5 And this hope will not lead to disappointment. For we know how dearly God loves us, because he has given us the Holy Spirit to fill our hearts with his love. Knowing this should excite us and then we can really shout with joy. It tells us that there really is a purpose and that we’ll be better witnesses on the other end. “Hard times”, when allowing God to work with us (remaining submissive), yields patience, compassion, joy, understanding, and perseverance. There are things you learn through difficulties that you simply cannot learn otherwise. Do you remember the book of Job? Job was blameless from the beginning. He naturally went through a great period of despair. When God finally reveals Himself to Job He sets Job straight by making it abundantly clear that He is God and Job is not. What I think is really cool is how God showcased His creation to illustrate just how great He is. This humbled Job. It was this great experience with the Almighty and the revelation of things “far too wonderful” for him that led to his repentance and, after praying for His friends, concluded His test. One significant lesson to learn from Job is that being blameless is not enough. If that is all you are seeking, you will miss out on Life Himself. What God desires most is for us to continually get to know and understand Him more which will only perfect our love and admiration for Him. This is why the greatest commandment is to “love God…” and not “Don’t sin and be blameless”. After all, it is our love for Him that ultimately gives us the power and desire to do good. Don’t count on advice or sympathy from ignorant friends, but pray for them. Spend time with people that know God personally more than you do. Usually, they are the older ones (not necessarily as in Job) at church that always seem to be full of joy. Continually strive to know God, both intellectually and personally (Bible reading, prayer, journaling to name a few activities). Do whatever it takes and pray that you stay humble and meek, keeping your heart soft. I’m not at all suggesting that if you continue seeking God that you’ll ever be worry-free, for even Jesus was distressed in the garden of Gethsemane. What I am saying is that listening to and following these words will greatly reduce your worry, giving you peace, improving your witness and moving you towards godliness rather than bitterness. Philippians 4: 4 Always be full of joy in the Lord. I say it again—rejoice! 5 Let everyone see that you are considerate in all you do. Remember, the Lord is coming soon. Matthew 6: 31 “So don’t worry about these things, saying, ‘What will we eat? What will we drink? What will we wear?’ 32 These things dominate the thoughts of unbelievers, but your heavenly Father already knows all your needs. 33 Seek the Kingdom of God above all else, and live righteously, and he will give you everything you need. If God, the Creator of all things seen and unseen, is for us, what do we have to worry about? 10 But he knows where I am going. When I was six years old and my dad threw me way up in the air, it was fun, exciting, and a time of joy. I trusted him. Not once did I doubt that he would catch me. It was a sure thing. It’s what he did, toss me into the air… and pull me down. I relied on him and never thought twice about it. He was my dad and I was his boy. 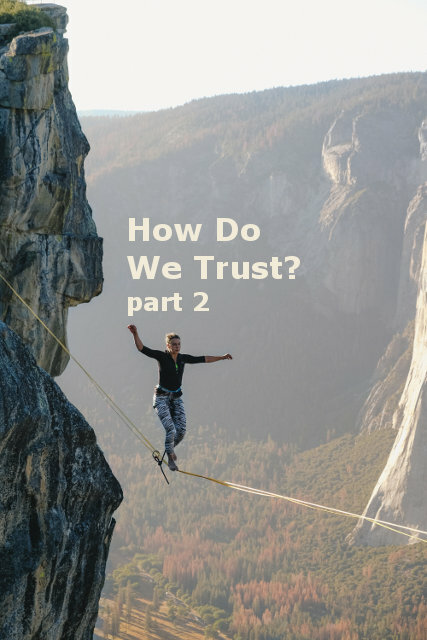 What was it that led me to trust him? First of all, he was the only dad I ever knew. I had six years as his child to know him enough. Second, he never gave me a reason not to. I was just learning how to be a kid and he was big enough, strong enough, and responsible enough to handle all my needs. He was there for me and made me feel safe. As a six-year-old boy, I was at total peace in his arms. The same arms that were able to crush the boogeyman in the closet, by the way. Can our trust in God be like this? I think so and I think He desires that more than anything. Reading this makes me think that God intends for us to know Him more intimately than most people know their dads today. The key words here are “learn to know”. But who has time for relationships anymore? Could it be that the single most important activity we should be participating in has taken the lowest priority? Luke 5: 16 But Jesus often withdrew to the wilderness for prayer. Mark 6: 45 Immediately after this, Jesus insisted that his disciples get back into the boat and head across the lake to Bethsaida, while he sent the people home. 46 After telling everyone good-bye, he went up into the hills by himself to pray. It appears in these last two verses that Jesus made a concerted effort to be alone with the Father, it was very important to Him. If His own son needed to spend time with God, how much more do we need it? Spending time with God alone is a learned habit and is developed over time. Alone time with God is not a natural activity. It is especially unusual for the newly awakened. For those fortunate enough to learn this discipline as a child or young adult, they’ve been greatly blessed with spiritual leadership in the home or church. If it’s the case that you are not finding the time to spend with God, then everything you are finding time for is more important than God. Yes, you may have a schedule, but where is God in that schedule? The time you spend throughout the week and day to day is an indicator of the priorities that you have set. It’s that simple. Try telling your wife that you have only five minutes to spend with her and that it will have to come after the 11 o’clock news, brushing your teeth, and before setting the alarm for the next morning. If this sounds familiar to you, I don’t think you are alone. These five minutes was a goal I used to have and at the time I was happy to do just that. I’d still fall asleep trying to pray. I know that God wants this time with you more than anything else you do. I am convinced that if you took the total time that you take on your Sabbath day from getting ready for church service to getting out of your church clothes and divided that time by seven to be spent each day, He would rather you spend that time alone with Him than corporately with others. Please don’t use this as an excuse not to go to church! By all means, keep it up. Just know that God values your alone time with Him more than He does as part of a group, although both are important. For those of you that desire a better relationship with God and seek the abundant life that Jesus promises, allow me to make a suggestion. Schedule time with God during your peak hours. A time during the day that you are most alert. Set aside at least 5 minutes and adjust accordingly. Devise a plan to read the Bible. Say you wish to read the book of Romans, one chapter a day, that’s great, but what will you read after that? Know that God is present and believe that He is with you. If this plan is followed consistently over time and you take it seriously, then I am certain that you will grow and this will turn into 10-15 minutes and even more as you develop this most sacred discipline. Are you taking Him seriously? Over the last four posts, we’ve been discussing the transformation process. The theme, in the form of a question, has been: “How Bad Do You Want To Be Transformed?”. If your definition of worship is limited to singing and praising God, let me suggest that you study these verses carefully. God deserves our worship, doesn’t He? What does it mean to you to “give your bodies to God”? I must confess that this is a tough verse for me. What it means to me is to allow Him to totally take over my life. He wants me to yield my time, my activities, my attitude, what I eat, what I drink, who I spend time with, what I consume with my eyes, my ears, and even what I think about! That is what a “living sacrifice” is all about. This means we can sing and worship in church all we want, but unless we are yielding our lives to Him with a soft heart, it is only lip service. Can you relate to the following verse at all? Would you say it applies to many sitting in our pews today? I can certainly relate to singing hymns of praise and walking out of church feeling far from God. I’ve had a hard heart before and that’s not a good place to be. Of course, transformation cannot begin unless we have a soft heart. The very fact that you are reading this message would lead me to believe that you are open to change and that your heart is not hard. The key now is to make yourself available to God and pursue Him with all you’ve got. Luke 8: 14 The seeds that fell among the thorns represent those who hear the message, but all too quickly the message is crowded out by the cares and riches and pleasures of this life. And so they never grow into maturity. Wouldn’t you rather be described like this? 15 And the seeds that fell on the good soil represent honest, good-hearted people who hear God’s word, cling to it, and patiently produce a huge harvest. So while your heart is soft, follow through with the rest of it. “hear God’s Word” (read the Bible), cling to it (meditate on what you read), and be patient, the harvest in your life will come. All the while we can plead to God in prayer to change our hearts. I have first-hand knowledge that He likes to answer these types of prayers. In order to be successful with a continual habit of reading the Word, it is highly recommended to associate and fellowship with others who do the same. In order to be successful at anything, it is required that you run with those seeking the same results. If you are not currently spending time with the likes of those seeking a closer walk with God, consider the Bible Team calls where some of them congregate on the phone. As you continue to expose yourself to His Word, seeking Him in prayer and getting to know other like-minded saints you will be staying in good soil and spiritual growth will happen, He’s promised. What better way to know Him that to read the Book He personally wrote? Romans 12: 3 Because of the privilege and authority God has given me, I give each of you this warning: Don’t think you are better than you really are. Be honest in your evaluation of yourselves, measuring yourselves by the faith God has given us. 4 Just as our bodies have many parts and each part has a special function, 5 so it is with Christ’s body. We are many parts of one body, and we all belong to each other. Do you realize that your personal faith and relationship with God has a tremendous impact on the lives around you? People are watching you, believers and non-believers alike. We all have a responsibility to each other and we, by default, either encourage or discourage others with our daily choices. Philippians 4: 8 And now, dear brothers and sisters, one final thing. Fix your thoughts on what is true, and honorable, and right, and pure, and lovely, and admirable. Think about things that are excellent and worthy of praise. 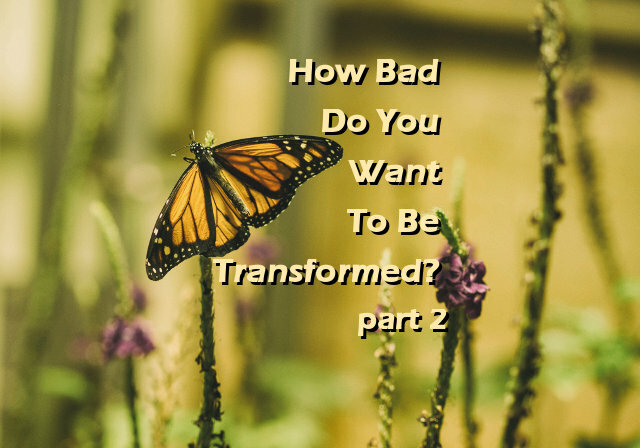 How bad do you want to be transformed? 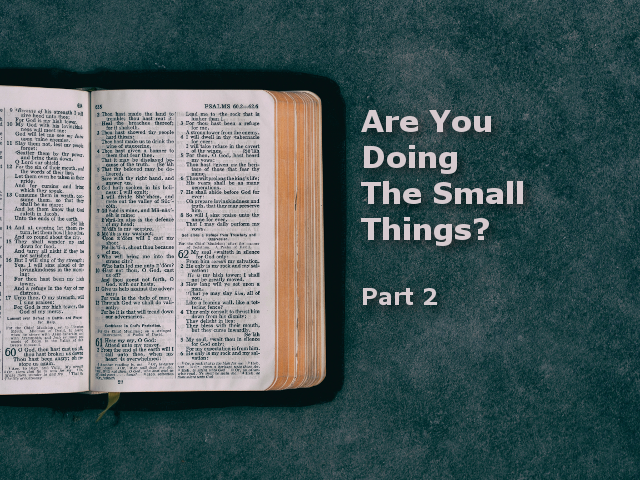 Over the last three parts of “How bad do you want to be transformed?”, we discussed Bible reading and prayer for the purposes of being transformed. To me, these are essential for steady growth and formation. But they are not enough. There is a third essential element to complete the trilogy. The Bible reading and prayer I’ve discussed are individual events. Fellowship is where we can share what we’ve learned and combine all three elements. Besides, if all our Christian activity is done in a vacuum, how can we know whether or not we are on a good path, much less learn solid doctrine? The personal and private knowledge from reading and praying is then shared and used to teach, learn and correct our theology. Colossians 3: 16 Let the message about Christ, in all its richness, fill your lives. Teach and counsel each other with all the wisdom he gives. Sing psalms and hymns and spiritual songs to God with thankful hearts. Let’s define fellowship for the purpose of this message. There may be many thoughts that come to mind regarding fellowship. You might think of fellowship dinners, socials or simply hanging out with friends. The fellowship I wish to discuss is a deliberate meeting among a very small group (2-6) of like-minded believers that meet with regularity. Note that this says “All the believers”. The purpose of this very small group will be to get to know more about God and each other. They will have Bibles in hand, prepared to talk about what they’ve been reading. This is not a formal gathering by all means but the intent to draw closer to God will be a serious one. I believe this is the ideal fellowship that any seeker that desires growth should be participating in. It is in these meetings that their lives are shared and personal issues are discussed. The Bible and common spiritual sense will be used to lovingly counsel one another. Such a group I believe should be constrained to one gender. Simply due to the more delicate nature that the conversation could lead to. Consider your current circle of “believing” friends. Do you have friends that enjoy talking about the Bible? It is my guess that if a person doesn’t favor discussing God’s Word in a Christian setting then there’s a good chance that they are not reading it. It is a human tendency not to discuss something that one is not engaged in. Especially when they might be embarrassed by their unfamiliarity. So if you have Church friends that are more interested in discussing politics, sports or the latest movies than the Word of God that is a pretty good indicator that they are not suitable for the fellowship we’ve been discussing. 2 Corinthians 6: 14 Don’t team up with those who are unbelievers. How can righteousness be a partner with wickedness? How can light live with darkness? I know this verse pertains to unbelievers, but should also apply to the lukewarm. Are you meeting on a regular business? 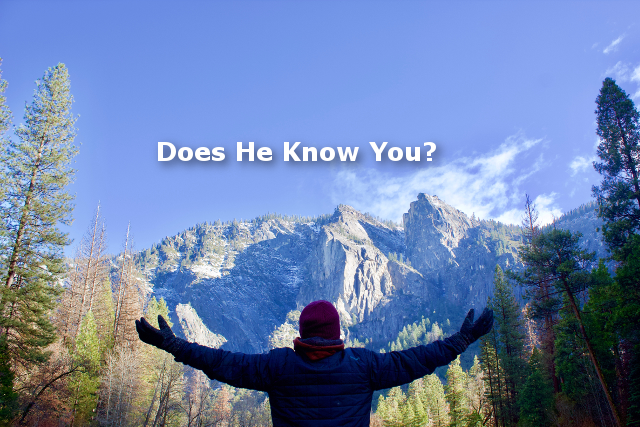 Are you meeting with a few people on a regular basis for the purpose of getting to know God more and each other? What better way is there to practice the two greatest commandments? This should be the heart of the Christian lifestyle. Finding and sharing with others that are serious about God will push you and encourage you to be a better follower of God. In the last two parts of “How Bad Do You Want To Be Transformed?” we’ve discussed reading the Word and Prayer in an effort to be transformed. I thought we’d spend a little more time in prayer. In my next post, I’ll discuss fellowship. I’ve always liked the idea of integrating prayer with Bible Reading. I think this is not only very practical but maximizes the reading and is ideal for transformation. 1 Samuel 12: 14 “Now if you fear and worship the Lord and listen to his voice, and if you do not rebel against the Lord’s commands, then both you and your king will show that you recognize the Lord as your God. 15 But if you rebel against the Lord’s commands and refuse to listen to him, then his hand will be as heavy upon you as it was upon your ancestors. Do you take this personally? I sure do. 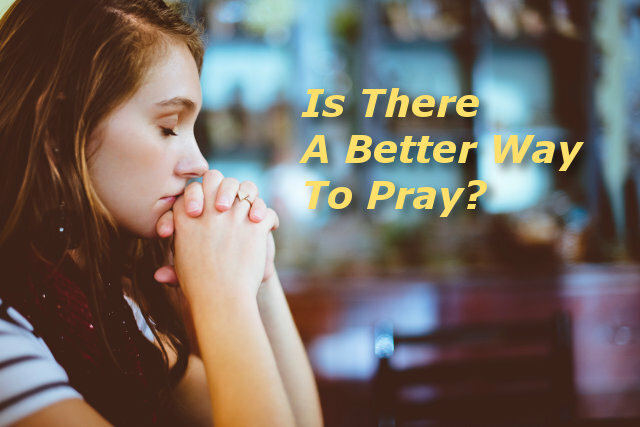 Another great idea is praying the prayers found in the Bible. The Psalms are ideal for this. Psalm 139 for example, is a great prayer to pray, yet too long for this message. 1 Thessalonians 5: 17 Never stop praying. Of all the ways and types of prayer, I believe this is the most important to be diligent at. I think this is where our power comes from. 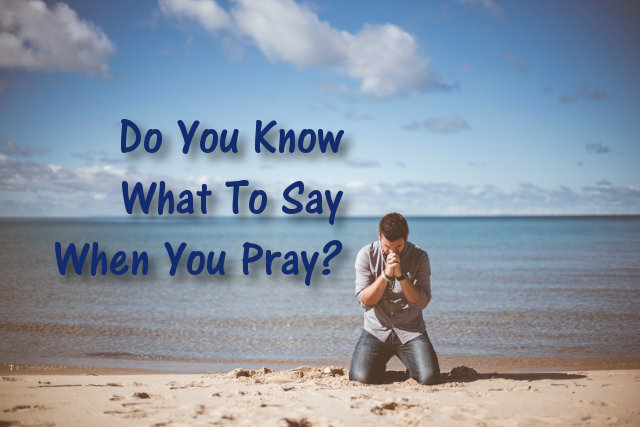 Matthew 6 5 “When you pray, don’t be like the hypocrites who love to pray publicly on street corners and in the synagogues where everyone can see them. I tell you the truth, that is all the reward they will ever get. 6 But when you pray, go away by yourself, shut the door behind you, and pray to your Father in private. Then your Father, who sees everything, will reward you. For me I’ve felt the urge to pray in various places and, if I’m alone, I will get on my knees. Some days, although I desire communion with Him, I don’t have anything specific to say. So I’ll just kneel there, in silence, or I’ll just praise Him. Eventually, I’ll have something to say or to discuss. Sometimes it’s quick, like when I get out of bed and have a busy day and I need to get going. However, I like to spend an undetermined amount of time, each day, on my knees with Him. To me, this and Bible reading are the best ways for me to “remain” or “abide in Him”. Last, but not least, I don’t want to leave out what may be the most important type of prayer, which is intercessory prayer. This can mean the difference between life and death. 1 Samuel 12: 23 “As for me, I will certainly not sin against the Lord by ending my prayers for you. And I will continue to teach you what is good and right. Deuteronomy 9: 20 The Lord was so angry with Aaron that he wanted to destroy him, too. But I prayed for Aaron, and the Lord spared him. I hope these ideas inspire you in your walk with God. Thank you for taking the time to read this most important message! The Bible is great for giving us examples of prayer. I’d like to review some prayers where the petitioners actually complain to the Lord. Remember this, when Abram was still waiting on a son that God promised him? He struggled with disbelief and spoke openly and honest to God. He sounds pretty frustrated at this point, doesn’t he! Have you ever protested to God? Have you ever asked these questions? I know I have. I just wanted to share these moments of doubt and frustration from a few of the greatest figures in the Bible. Their faith was tested and they endured challenging moments. They didn’t know what was going on, but what mattered most is that they took their issues to God, the One that delivered each of them from their pain. Despite all these examples, sometimes I come before God and I have no idea what to say. Sometimes I’m not even sure what I’m feeling. But I know that it is OK to just sit quietly before God. You really don’t have to say anything, just sit in silence. If you sit long enough words will start to come out and the conversation will start, just give it a chance.